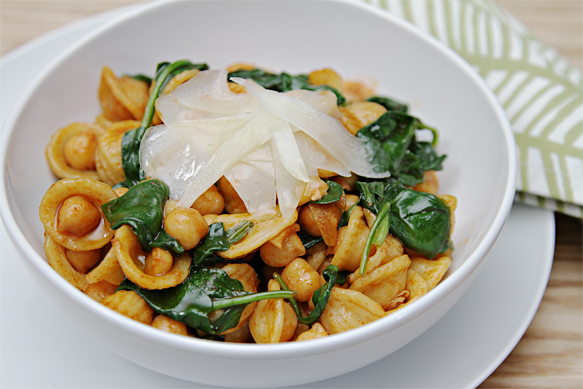 Viviane Bauquet Farre loves recipes “that can be thrown together in minutes, yet are healthful and over-the-top delicious.” Viviane, a whiz at creating wonderful dishes, has done just that with the orecchiette pasta featured here. It’s landed a top spot on our to-do list of flavorful, healthy recipes for the New Year. The orecchiette — “little ears” in Italian — gets a good dose of smoked Spanish paprika, or pimentón, that adds a “seductive smokiness.” The dish is finished with shavings of nutty Manchego cheese and a drizzle of extra virgin olive oil. “Hearty, smoky, savory, this pasta dish delivers heaps of flavor and leaves you feeling utterly satisfied,” Viviane says.